How do you connect to the VM from an remote location? Do you RDP using MSTSC to the Host Machine first and from there use Server Manager for remoting to the VM? How does your setup look like on this topic? I have activated remote desktop on a few VM’s and then using port forwarding to their respective IP address and port. But this is pretty cumbersome, maybe there is a better way (probably) to do this. RDP to host and then connecting or RDP to VM will work. I don’t prefer to open too many ports (one for each VM as well) for security reasons. If you have a Linux machine or VM, you could tunnel pretty much anything through one ssh connection. This approach lets you have multiple simultaneous TCP connections to different IP addresses on your network by opening just one port for SSH. If you don’t want to set up a Linux instance, you could set up an SSH daemon on the hyper-v host in case you would like to try this approach. Thanks for the answer and suggestions. Was pretty tired and forgot the part explaining that I already have a Debian machine with SSH that I use for port forwarding to the VM’s. I also think it’s nice to have as few ports as possible open and encrypted communication is a necessity. This approach works great when thinking about it. Only thing I would want is an easier way of connecting when using a new computer somewhere. I.e. setting up Putty, configure the tunnel and connecting using mstsc. Maybe the only thing I need is a tool (pre-configured) to make fewer steps on the client when connecting. Googling away. Putty is pretty portable and stores the session config in registry. So, you may export the registry entries to a .reg file. Instead of tunneling RDP through SSH, you could carry a VNC client executable and use rdesktop from Linux to RDP to Windows. Thus, you could carry a few small files and work with one tunnel for VNC. As there is only one tunnel, you could just configure it as needed instead of carrying the .reg file. Wow, I am not sure if someone has said thank you enough for sharing this great info. This is exactly what I am looking for, I have just built my server and I was about to ins WS 2008 R2, there are some nuanced differences between my server hardware and yours but overall it is close. Thanks again for sharing. Excellent post! Did you end up sticking with 2008r2 core with HyperV as the host? Also, where is your DC… is it a VM? I stopped using core after the first attempt. I am using the full server as the host. Yes, the DC is a VM. How many VM’s did you end up creating? We are working on doing this setup at home as well and are on the fence whether to splurge for a motherboard with dual socket CPU’s or if we can get away with just one high powered one. I want to be ‘future-proofed’ but at the same time this will just be for our own personal home use, I just love the idea of a crazy ‘seats’ setup – each being able to log in to our personal hosts from anywhere in the house, easily switching between rooms and devices. At most times it will probably only be running 2 VM’s for ourseves (power users – gaming, photo editing, etc) and probably a VM for the dc that won’t require much resources. Any others (guests, media) if we create them will only be spun up occasionally I think.. Any advice will be greatly appreciated! I have several (10-15) but I don’t have them all running at the same time. I do have couple of workstations (Win7 and WIn8), a DC, and some Win servers to test out server software, and a Linux VM. For anything UI-focused, just remember that you will be remoting in, so the UI responsiveness might not be great. I don’t use the VMs for gaming or photo/video editing. If you just need 4-5 VMs, you could get away with a single quad-core CPU. Hi, I found your site whilst searching for setup of Hyper-V on a home server/lab. 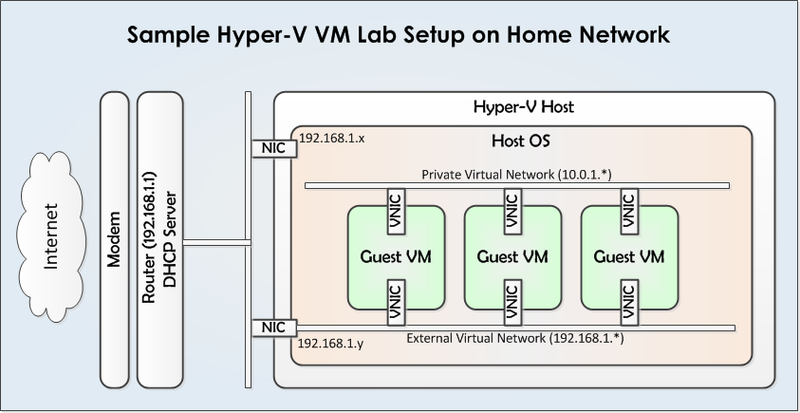 This is something I am also looking into doing, however the biggest difference being I would use Hyper-V 2012R2 Stand-alone (maybe 2016 Nano….). Have the remote management tools improved since 2008R2? My main PC is running Windows 10 Professional and I was toying with the idea of utilising the WIndows 10 RSAT on this to perform all necessary configuration. Anyway, the main question I have is what setup do you utilise for VM redundancy/backups? I am looking at running around 4x VMs, one for File Sharing/Personal Cloud, another for PLEX media streaming, and 2x OTHER. Ideally I want the first two to have some form of redundancy/backup as they will host Data that cannot be lost. The Server I am looking to purchase for this is a Dell PowerEdge T20, it has software RAID on the motherboard therefore I could in theory configure a number of disks in RAID 1 or 6, or alteratively create a pool of disks as Mirrored within Storage Spaces. Is this the best way, or am I best at looking at alternative backup solutions for the VMs only?